(PR) (Trenton, NJ) – Austin Krum drove in three runs and the rehabbing Ramiro Pena drove in another to lead the Trenton Thunder (65-70) past the first-place New Hampshire Fisher Cats (73-64) 7-2 on Monday night at Waterfront Park. The Thunder offense used a pair of three-run innings to back Steve Garrison, who threw 5.2 strong frames to grab his fourth win of the season. The win in the third game of the four-game set breaks a seven-game losing streak for the Thunder and keeps the team’s faint playoff hope alive in the Eastern League Eastern Division. In a 1-1 game in the bottom of the fifth inning, the Thunder struck for three runs to take their first lead in six days. With nobody on and two outs, Jose Pirela began the rally with a stand-up triple into the gap in right-center field. After an Addison Maruszak walk, Ramiro Pena singled into centerfield to score Pirela and give the Thunder the lead. A batter later, Austin Krum roped a triple into deep right field to clear the bases and put Trenton in the advantage 4-1. In need of an insurance run or two in the bottom of the seventh inning, the Thunder brought three more runs home to take a 7-2 lead. With the bases loaded and no outs, Austin Krum scored Jose Pirela from third to drive in his third run of the game. Corban Joseph then golfed a double down the right field line to score another run. Rob Lyerly capped off the three-run rally with a two-out single up the middle to score Joseph. Ewing, New Jersey-native Steve Garrison returned from the Disabled List to pitch his hometown team to the win. The lefty allowed just two runs on three hits in 5.2 innings pitched. Garrison then turned the game over to the Trenton bullpen, who retired all ten men that they faced. The win for the Thunder also clinches the season series over the New Hampshire Fisher Cats at 11-8 with one game left. The Thunder will finish their home portion of the 2011 season on Thursday night with the final game of a four-game set with the New Hampshire Fisher Cats. Trenton will give the pearl to LHP Shaeffer Hall (10-7, 4.26), while the Fisher Cats will counter with the Major League-rehabbing RHP Dustin McGowan (0-2, 3.38). The SBLI Pre-Game Show with Jay Burnham and Hank Fuerst begins at 6:45 PM. Fans can tune-in to the game on 91.3 WTSR-FM, WCBB 1490-AM and online at trentonthunder.com. On Fan Appreciation Night during Thursday’s ballgame, fans can enjoy the final Thirsty Thursday of the season presented by Budweiser and WPST. After the game, a fireworks show presented by St. Francis Medical Center will finish off the 2011 home schedule in style. For ticket information, log on to trentonthunder.com or call the Thunder Ticket Office at 609-394-3300. (PR) (Trenton, NJ) – The Trenton Thunder, Double-A Affiliate of the New York Yankees, announce that LHP Steve Garrison has been activated from the Disabled List. In a corresponding move, LHP Kei Igawa has been placed on the Disabled List. The moves leave the team’s 24-man active roster at its full capacity. Garrison is scheduled to make his first start since June 17 after missing two weeks with a blister on his throwing hand. The lefty and Ewing, NJ-native is 3-8 with a 6.86 ERA in 15 games (14 starts) this season with the Thunder. 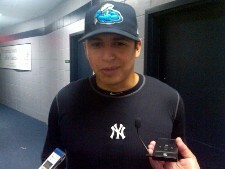 Garrison made his Major League debut on July 25, hurling 0.2 innings in a Yankee win in the Bronx over the Mariners. Trenton and New Hampshire continue their series on Wednesday night at 7:05 PM from Waterfront Park. The Thunder will give the start to LHP Steve Garrison (3-8, 6.86), while the Fisher Cats will counter with RHP Yohan Pino (3-7, 4.09). The SBLI Pre-Game Show with Jay Burnham and Hank Fuerst begins at 6:45 PM. Fans can tune-in to the game on 91.3 WTSR-FM and online at trentonthunder.com. The first 2,000 fans (ages six and older) to Wednesday’s game will receive Andy Pettitte Statues courtesy of Verizon Wireless. It is also the last Wawa Wednesday of the season. For ticket information, log on to trentonthunder.com or call the Thunder Ticket Office at 609-394-3300. I think my game story can only be found online…deadlines were a little earlier than usual today. Also, another big thanks to Trentonian sports editor Matthew Osborne for believing in me to cover a handful of games for him this season. Again, I go back to my fan days with this team where I’d show up to the ballpark around 3 PM to try to sneak in and watch batting practice and pester guys for autographs, and I’d pick up a copy of the Trentonian or…gasp…The Times to occupy myself. To have my byline in a Trenton paper on the big beat in town means a lot. — Sappy stuff aside, the Thunder lost. For those of you keeping score at home, my first advice to you would be to get out more. But secondly, that marks seven straight such outcomes for Trenton, who now sits at 64-70. Their loss tonight wiped out any chance of them somehow pulling an Eastern Division title out of their rear ends, and with New Britain’s win, their tragic number now sits at three for being eliminated from playoff contention entirely. Spoiler alert, this squad ain’t makin’ the playoffs. — The first inning was, in a way, a bit of a microcosm for the last two months. New Hampshire put a run on the board in the top of the frame with a Travis d’Arnaud sacrifice fly, but Trenton’s catcher, Austin Romine, seemed to answer back with one of his own. Except not so much. The umpires ruled that Austin Krum had left third base early, which resulted instead in an inning-ending double play. According to Tony Franklin, Krum did not feel he left early. Also according to Franklin, however, third base coach Justin Pope said that he had left early, which was why Franklin didn’t argue the call. — Franklin did argue another call in the fourth inning, after Austin Romine was punched out on a called third strike. First base umpire Jon Saphire appeared to signal that Franklin shouldn’t come out and argue it, but he did anyway and was pretty quickly asked to leave the game. “I think Jon got the call wrong, plain and simple,” said Franklin, matter of factly. I asked Franklin if part of the ejection — he had to know he was going to get run — was in part to try to rally his team. “I knew I was going. I felt it was a good time to go,” he said. — Ramiro Pena, you may remember him from such films as “Trenton Thunder: 2005,” and the subsequent three sequels, was a surprise guest at the ol’ ballyard today. Never had any hint he was coming, and I picked up a lineup at around 2:50 PM and boom, there he is listed as the leadoff hitter and shortstop. Pena seemed a little rusty on his first defensive chance of sorts in the first inning, allowing a fairly good throw from Romine to sail past him into center field…but other than that, it wasn’t too bad of a night. He struck out looking in the first and grounded into a 6-4-3 DP in the third, but saved his evening with a nice RBI single to left field that scored the second of the Thunder’s two runs on the night. He was, as was the plan, replaced by Yadil “The Real Deal” Mujica as a pinch runner…Mujica subsequently took over at shortstop as well. Pena was remarkably candid in his comments outside of the clubhouse after his exit, saying he didn’t feel like he was ready to return to the big leagues yet, and that he might need the remaining seven games he could, in theory, play with the Thunder before their season ends on September 5th to get completely ready for a return. Pena is still on track to play seven innings tomorrow. He is fully recovered from an emergency appendectomy, which he underwent on his 26th birthday. “You know, it’s nice to do that any time this time of the season,” he told me. But, but, but…you played here! “I’ve been with nine different organizations, so for me it’s not really a big deal,” Howard said. — Corban Joseph was the only player from the Trenton Thunder selected to play in the Arizona Fall League. He, David Phelps, Rob Segedin and Ronnier Mustelier will be members of the Phoenix Desert Dogs. You can see some of Joseph’s comments in the paper, but one extra nugget I wanted to share was something I’ve noticed during the season. I don’t want to give him the Zoolander label, and I was a little hesitant bringing this up with him…but he mentioned he wanted to work on his range a little bit in the AFL, and I brought up that I felt his range was much better to his left than to his right. He’s made some amazing plays this season, but usually it’s when he goes to his left…so I asked him about that, and thought his response was honest and interesting. “I’d say that (my range) has it’s days,” he said. — That little crack at The Times was obviously a joke…they have a great paper as well, of course, and John Nalbone’s story on Tony Franklin’s plans for 2012 are more evidence of that. Nice work by my buddy on that one. — Ballpark Digest named Thunder director of broadcasting Jay Burnham their 2011 Broadcaster of the Year. I’ll be honest and admit that I don’t listen to games on the radio, but I can tell you that I’ve got to know Jay over the past two years and am proud to consider him a friend. He’s a great dude and deserving of any honors that are bestowed upon him. Both he and Hank Fuerst have been a lot of fun to work with this season, and both make my job a hell of a lot easier. Two talented kids who I think you’ll see in the show one day…well, hear not see…but you get the idea. First inning — Seemed a little rusty on a throw to second base by Austin Romine on a potential caught stealing…but made a nice defensive play to range to his right and keep a ball in the infield…struck out looking in his first at-bat. Third inning — 6-4-3 DP groundout. Fifth inning — RBI single through the left side for Pena, and he’s out of the game for Yadil Mujica. 6:25 PM — Corban Joseph, as you likely already know is slated to play in the Arizona Fall League this season. He’ll be joined by David Phelps, Rob Segedin and Ronnier Mustelier. Pena expects to play the remaining eight games with the Thunder…however, the smart money still seems to be on him being activated when big league rosters expand on September 1st. He’ll play five innings today and seven innings tomorrow. (PR) (Trenton, NJ) – The New Hampshire Fisher Cats (72-63) used their second eight-run inning against the Trenton Thunder (64-69) in the last six days on their way to a 10-4 win on Monday night at Waterfront Park. In game one of the season’s final home series, a four-game set, the Thunder drop their sixth straight game and fall to the season’s low-water mark of five games below .500. Austin Romine had three hits and Jose Pirela hit his eighth homerun of the season on an otherwise quiet night for the Thunder offense. The story on Monday night was New Hampshire’s eight-run fourth inning against Thunder pitchers Craig Heyer and Cory Arbiso. Entering the inning, the Thunder and Fisher Cats were tied at 1-1, but the score stood at 9-1 when all was said and done. The key play in the inning was a grand slam for Travis d’Arnaud, who was recently named the 2011 Eastern League Most Valuable Player. Heyer, who was unable to finish the inning and finished his night allowing a career-high eight runs, five earned runs and seven hits. New Hampshire also scored eight times in the bottom of the eighth inning last Wednesday night in the 16-3 victory over Trenton in Manchester, NH. 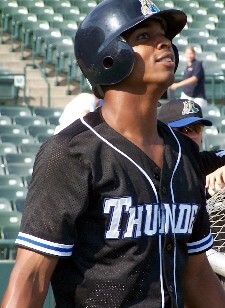 Melky Mesa contributed to three of the four runs scored by the Thunder on Monday night. In the second, Mesa grounded a ball to third when Rob Lyerly scored on an errant throw at the plate. In the fourth inning, Mesa lined a single to left field to drive home his thirty-eighth run of the season. Then in the sixth, Mesa doubled to lead off the inning and scored later in the frame as Damon Sublett reached on an error at first base. Austin Romine also contributed to the Thunder offense with his eighth three-hit game of the season. The Thunder and the Fisher Cats will continue their series on Tuesday night at 7:05 PM from Waterfront Park. Trenton will give the pearl to RHP Graham Stoneburner (1-4, 3.80), while New Hampshire will send RHP Drew Hutchison (1-0, 0.00) to the mound. The SBLI Pre-Game Show with Jay Burnham and Hank Fuerst begins at 6:45 PM. Fans can tune-in to the game on 91.3 WTSR-FM and online at trentonthunder.com. The first 1,000 fans (ages 5-15) to Tuesday’s game will receive 2010 Eastern League M.V.P. Brandon Laird Mini Bats courtesy of Macy’s. It’s also the last time in 2011 that fans will be able to take advantage of a Super Value Tuesday and KRAFT Singles Tuesday Night Tickets. At Super Value Tuesday’s, fans can enjoy $1 Hot Dogs and kids eat free. (PR) (Trenton, NJ)- Waterfront Park in Trenton, NJ, home of the Trenton Thunder, suffered no damage or flooding and is ready for baseball in the wake of Hurricane Irene. The team starts its final home series of the regular season tonight at 7:05pm against the New Hampshire Fisher Cats. Due to road closures and damage sustained in and around Trenton, the Thunder organization is offering rain checks to all fans with tickets for tonight’s game, should they decide not to attend. Fans with tickets to the game on Monday, August 29 may exchange them for tickets of equal or lesser value to another 2011 Thunder regular season home game, or any game in April or May 2012, subject to availability. Ticket stubs may be presented in person at the Thunder Ticket Office at Waterfront Park. Fans wishing to exchange for a 2012 ticket must do so starting in February 2012. * From 295 North or South, exit at Route 29 North and bear right onto Route 129 then turn left at Cass Street (Thunder Road) and continue straight to the ballpark. * From all Pennsylvania points, take 95 North into New Jersey until it becomes 295 South then follow the instructions above. * From points north of Waterfront Park on Route 29, take Rt. 29 to 95 North and follow instructions above. * From points east, use 195 and continue straight as it becomes Route 29 North. Bear right onto Route 129 then turn left at Cass Street (Thunder Road) and continue straight to the ballpark. The Thunder encourage fans who are without power to bring cell phones, laptops and the appropriate power chargers with them to the game so they can be recharged. The Thunder will provide free wireless internet access and a free charging station. The Thunder welcome the New Hampshire Fisher Cats (Toronto Blue Jays) to Trenton for the final four games of the regular season, tonight through Thursday, all starting at 7:05pm. Tonight’s game features a Souvenir Travel Cup giveaway #6 (1st 1,000, 6+) presented by SBLI. Tomorrow night is 2010 EL MVP Brandon Laird Mini Bat giveaway (1st 1,000, 5-15) presented by Macy’s. It’s also Super Value Tuesday with $1 Hot Dogs AND Kids Eat Free Courtesy of On The Border. Wednesday night is the much anticipated Andy Pettitte Statue (Thunder Home Uniform) (1st 2,000, 6+) presented by Verizon Wireless. Five of the statues are autographed by Andy Pettitte and will be randomly inserted among the ones at the entrances. Thursday’s season finale features fireworks presented by St. Francis Medical Center plus Thirsty Thursday presented by Budweiser and WPST. Fans can enjoy $2 Bud and Bud Lights from gates open until the middle of the 5th inning. The Thunder encourage people who had tickets to any of this season’s rained out games to exchange them this week. Only four games remain this season. Rain checks are being offered for April 16, August 19, August 21, August 27 and August 28. The forecast for this week’s games calls for highs in the mid-80’s and little chance of rain. Tickets are available by calling 609-394-3300 or online at trentonthunder.com. (PR) (Trenton, NJ) – In game one of a scheduled doubleheader, the New Britain Rock Cats (68-65) used another late charge to win over the Trenton Thunder (64-68) on Saturday afternoon. The second game of the doubleheader was postponed due to rain and the threat of severe weather. The seven-inning win for the Rock Cats gives the team a rain-shortened sweep over the Thunder, who drop to the season’s low water mark at four games below .500.Fans with tickets to either the Saturday night (7:05pm) game or the Sunday evening (5:05pm) game may exchange them for tickets of equal or lesser value to another 2011 Thunder regular season home game, or any game in April or May 2012, subject to availability. Ticket stubs may be presented in person at the Thunder Ticket Office at Waterfront Park. Fans wishing to exchange for a 2012 ticket must do so starting in February 2012. The doubleheader was announced on Friday as an attempt to play the games prior to the arrival of Hurricane Irene. The games scheduled for Saturday (8/27) at 7:05 pm and Sunday (8/28) at 5:05 pm were rescheduled to be part of the today’s doubleheader. There is now no game scheduled for Saturday, August 27 at 7:05pm or Sunday, August 28 at 5:05pm. No make-up date has been set for today’s second game but it will likely to be played when the Thunder visit New Britain September 2-5. More details will be announced at a later date. All of the offense for the Thunder on Saturday afternoon came in the fourth inning to erase a 4-0 Rock Cat deficit. After Corban Joseph doubled to lead off the frame, Austin Romine homered over the wall in right-centerfield to cut the New Britain lead in half, 4-2. The Thunder eventually tied the score 4-4 later in the inning on an RBI-triple by Damon Sublett and a sacrifice fly for Jose Pirela. However, the Rock Cats used another clutch, late-inning charge to win, scoring three runs in the top of the seventh. Cats starting on Monday, August 29. Monday’s forecast calls for sunny skies, a high of 79 degrees and 0% chance of rain. Tickets are available by calling 609-394-3300 or online at trentonthunder.com. 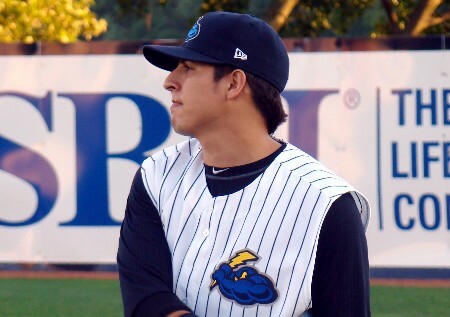 (PR) (Trenton, NJ) – The Trenton Thunder, Double-A Affiliate of the New York Yankees, announce that RHP Jeff Marquez has been added to the team’s roster. In a corresponding move, C Ryan Baker has been placed on the Disabled List. The moves bring the Thunder 24-man active roster to its maximum capacity. Marquez hurled six innings in a Major League rehab last Saturday, leading the Thunder to a win over the Bowie Baysox. The righty originally came up with the Thunder in the Yankees system but was traded to the White Sox in the 2008 offseason in the Nick Swisher deal. 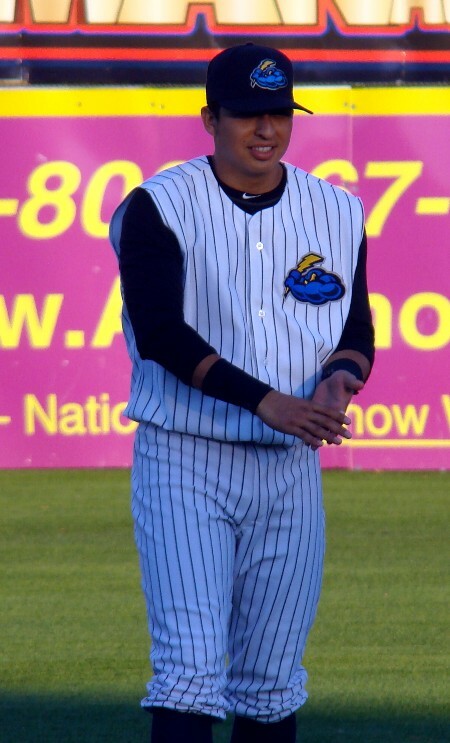 Marquez, who made his Major League debut on July 9, 2010, with the White Sox, was designated for assignment in June of this year and was claimed off of waivers by the Yankees. In three June relief appearances with the Yankees this season, the Vacaville, CA-native allowed one earned run in 4.0 innings pitched. The games scheduled for Saturday (8/27) at 7:05 PM and Sunday (8/28) at 5:05 PM will be played as a doubleheader on Saturday starting at 12:05 PM. Tickets for Saturday night’s 7:05 PM game will be honored for Saturday’s doubleheader. Tickets for Sunday evening may be used for Saturday’s doubleheader but fans must stop at the ticket office at Waterfront Park to have their ticket validated prior to entering the stadium. Fans with tickets to either game may exchange them for tickets of equal or lesser value to another 2011 Thunder regular season home game or any game in April 2012 including Opening Night, subject to availability. Ticket stubs may be presented in person at the Thunder Ticket Office at Waterfront Park. Fans wishing to exchange for a 2012 ticket must do so starting in February 2012. The NJEA Back to School Night Kids Notebook giveaway (first 1,500 fans, ages 5-15) slated for Saturday night will be distributed starting at 11:05 AM. The Good Deed Game charitable drives will take place throughout the game. Fans should bring their donations to the front office lobby and ask for Thunder Director of Community Relations, Patience Purdy. Both games can be heard on the flagship station of Trenton Thunder baseball, 91.3 WTSR-FM, as well as online at trentonthunder.com. Tune in to the SBLI Pre-Game Show with Jay Burnham and Hank Fuerst at 11:45 AM. The Thunder will send RHP Jeff Marquez (1-0, 3.00) to the mound in game one and RHP Cory Arbiso (5-5, 4.98) in game two. The Rock Cats will send RHP Matt Schuld (1-2, 7.47) to the mound in game one. New Britain has not named a starter for game two. (PR) (Trenton, NJ) – After leading for the majority of the night in a crucial Eastern Division tilt, the Trenton Thunder (64-67) allowed three runs in the top of the ninth inning to the New Britain Rock Cats (67-65) in a 4-2 loss in front of 6,041 fans on Friday night at Waterfront Park. In the second game of a four-game set, Joe Benson’s two-run triple off of Thunder closer Ryan Pope in the ninth inning provided just enough for the Rock Cats in their clutch win over the Thunder. The loss, Trenton’s fifteenth in 23 games in August, drops the Thunder to three games below .500 for the first time since May 3. For the second time in as many nights, the Thunder scored the game’s first run to take an early lead. Austin Romine and Rob Lyerly singled and Melky Mesa was hit by a pitch to load the bases with two outs. Jose Pirela then singled on the infield behind the second base bag to score Romine from third to give Trenton the 1-0 lead. In a 1-1 game in the bottom of the seventh, the Thunder used some good base running to break the tie and take a 2-1 lead. Jose Pirela singled to lead off the frame and later scored on an Austin Krum sacrifice fly to deep left field. Pirela was at the third base bag because of a key steal off of Rock Cats’ reliever Deolis Guerra that set up the go-ahead run. The inability to add to their late, one-run lead came back to haunt the Thunder, though, as the Rock Cats struck for three runs in the top of the ninth inning. Ryan Pope, who was six of seven in save opportunities entering Friday’s ninth, allowed a two-run triple to Joe Benson and an RBI-single to Chris Parmelee to give the Rock Cats the lead and the eventual win.